So yesterday, I had a little blog meltdown. I got a bunch of feedback about chilling out and not worrying so much. I guess to better explain it, I’m not so worried about the weight gain as much as I am about going off course. Some people will look at it and say, “just don’t eat garbage, it’s all in your control”. And at the end of the day, this is true. But when you have issues with food, it becomes more complicated than that. As with any addictive type behavior, when you fall off track a little, it can very quickly become a lot. Having lost significant weight in the past only to gain it all back very quickly – I know that this needs to be an everyday battle. A friend said to me yesterday (about a different matter) – “Always Forward, Never Straight”. That sums it up pretty nicely I think. I hope the failures of my past will lead me to become smarter and more steadfast. For now, I feel like I’m getting back on track. And so begins week 23 of my switch to a plant based diet with increased exercise. Except that this past week I ate less veggies, exercised not nearly enough and ended gaining four pounds back. Bringing my total lost from 67 to 63 pounds. These last 10 pounds have been such a killer. Just a back and forth… And despite the hard work to get to this point, I really have bungled it up these last 8 days. Prime rib, sushi, shrimp, Taco Bell, Memorial Day burgers, birthday ice cream and cake, chips… I’m disgusted with myself. After trying to hit the reset button and really tighten up my strategy a few days ago – I just totally derailed. I could give a bunch of excuses but what’s the point. The result is still the same. Back to the drawing board………..
Wow, what a couple of weeks it has been. Work has been insanely crazy. And some photography gigs and other artistic pursuits have kept me extra busy during my typical downtime. Trying to eat healthier while running myself ragged is also quite a challenge. Admittedly I’m struggling some days. But that is the beauty of each new day, waking up and getting a chance to start over from scratch and make your life what you want it to be. Each day is a chance to recommit and become my best self. Last night I had the best sleep that I have had in weeks. That alone makes such a difference. This week I celebrated my 37th birthday. As I get older, birthdays become a strange thing. As a child I would look so forward to birthdays and presents and parties with friends. Nowadays though, I’m content to push the day off and try to find a way to go in reverse. It’s not getting older that scares me as much as it is having less time. In some ways I feel like this lifestyle change is a way to counteract thatt. To make some changes in order to lose wight while gaining energy and better well being. In so many ways, eating plant based has been like finding the fountain of youth. When I was in high school I wanted to get into law enforcement. I always had this nagging feeling that I wouldn’t live past my 2o’s. I thought for sure I would be shot and killed while in that line of duty. It’s weird but true. In college I was actually shot at (being somewhere at the wrong place and time) and got away physically unharmed. That is a story for another time. That experience though made me feel temporarily bullet proof and the fear of being shot has never really returned. But over the years since then, I put on well over 125 pounds. I started to think that my poor lifestyle would be the thing to do me in. I thought for sure I’d be checking out early just because I had let myself go so badly. There comes a point where a person can feel like staying on the path they are on is just easier than making the difficult changes. I’m happy that as I begin my 27th year on this planet, I’m making changes that should help improve my quality of life and hopefully keep me in the game longer. I feel tremendous gratitude for my family and friends. My life is blessed. I am striving to be the best that I can be. I feel thankful for a job that makes me crazy but really does do a small part to make the lives if children a little bit better. I am extremely grateful for my outside pursuits in the arts, the chances it gives me to express myself and meet fascinating, wonderful people along the way who have amazing stories. Life is good. I’m going to try to make it even better in the next year. 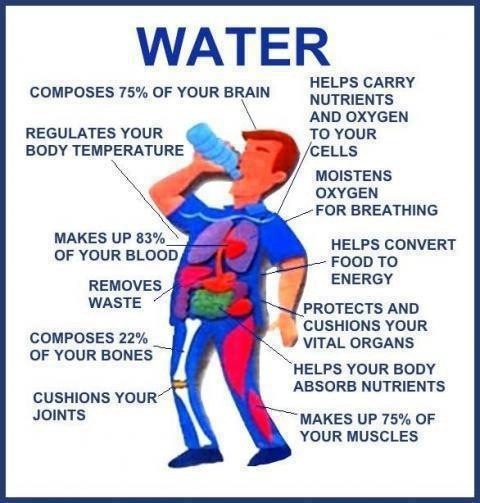 Just a reminder to drink your water! It’s an easy free way to take care of your body. Water can reduce the Risk of Cancer: Related to the digestive system, some studies show that drinking a healthy amount of water may reduce the risks of bladder cancer and colon cancer. Water dilutes the concentration of cancer-causing agents in the urine and shortens the time in which they are in contact with bladder lining.